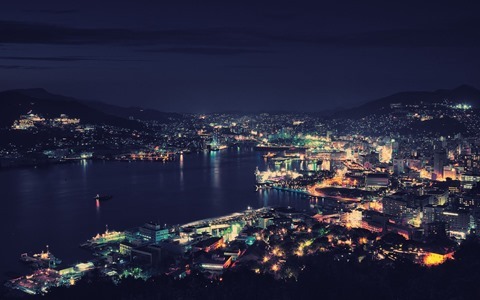 The city of Nagasaki was authorized in 2012 by one of world’s three greatest night views. Here you could see some Nagasaki Night View photos. The place where a night view is seen most beautiful is an observatory of the Mt. Inasa (Inasayama) which is a 333 meter high mountain in close distance to Nagasaki’s city center. The night views from Mount Inasa are ranked among Japan’s three best night views besides the views from Mount Hakodate and Mount Rokko. Two years ago, I seen the night view from Mount Rokko in Kobe. And this year, I came to Nagasaki, wanted to check the night of of Mount Inasa. 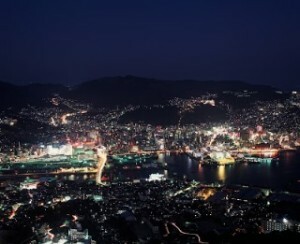 The night view of Nagasaki is also said to be a night view of 10 million dollars. The summit can be reached by ropeway, bus or car and when you arrive at the top, with its 360-degree view, you can see all the lights and landmarks of Nagasaki. I think this is a must see in Nagasaki, and not only is it easy to access but it is a very peaceful and beautiful place. It is such as jewelry box of radiance, as the Japanese said. But unfortunately, I couldn’t go to the top of Mount Inasa, since I had to meet the 20.22 train back to Saga. But it’s fine, since I could go to Huis Ten Bosch in morning and travelling around Nagasaki in the afternoon. I visited Oura Tenshudo, Glover Garden and Nagasaki Deck.I also had dinner at a big mall near Urakami Station, bought some souvenirs and went back to Nagasaki Station at around 8 pm.